Services marketing budgets are reaching new heights in 2017 as companies continue to invest in new areas of growth and the ongoing transformation of marketing itself, according to ITSMA’s 2017 services marketing budget and trends study with 46 leading B2B technology and services firms. On average, the B2B services marketing budget will grow 4.4% in 2017 to reach 1.7% of total services revenue, which is higher than it has been in more than a decade. Growth in marketing spending will lag projected growth in services, however. Marketers in the ITSMA study anticipate worldwide growth in services revenue of almost 11% this year. Moreover, the average increase in marketing spending masks a great divide between services growth leaders and laggards. Among the growth leaders, a majority of organizations are increasing marketing spending and staff, while only about one-third of the laggards are similarly increasing marketing spending and staff. Perhaps more important, the growth leaders are much more likely to contribute directly to business strategy and innovation, invest in more agile ways of working, and emphasize overall customer experience and success. From a budget allocation perspective, services marketers are slightly shifting the people-programs balance compared with last year. Estimates for 2017 include 52% for program spend vs. 48% for people, compared with a straight 50-50 split in 2016. The top areas for increased spending include content and communications, sales and field enablement, and marketing operations. Marketers are also continuing to shift spending from offline marketing to digital, with digital now comprising 49% of total services marketing spending. Account-based marketing continues to grow, with almost half of the survey participants already implementing ABM and another 26% planning on beginning in the next year or two. Of those groups already doing ABM, a majority are increasing spending in 2017 and ABM overall will comprise 17% of the total services marketing budget (compared with 13% last year). 2017 Services Marketing Budget Allocations and Trends, a PowerPoint-style report, delivers a detailed look at the state of the services marketing profession as it exists in early 2017. It provides data on services marketing budgets, budget allocations, and marketing priorities from a range of companies across the technology and professional services industries. 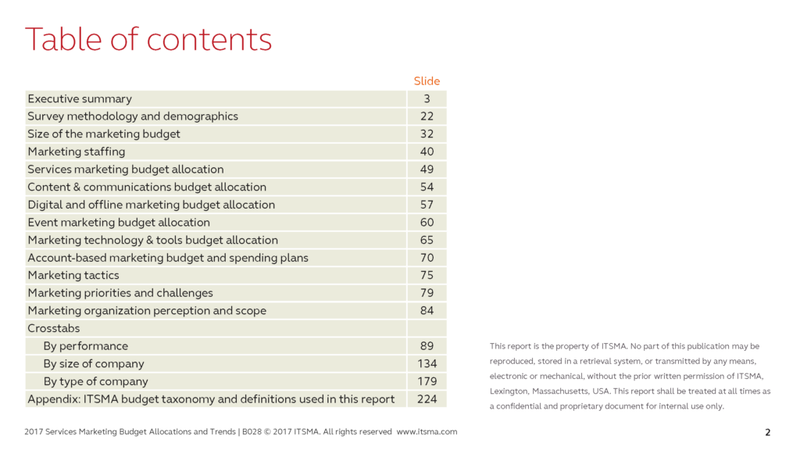 ITSMA gathered detailed data on services marketing budgets, trends, and priorities from a cross-section of large B2B technology and IT services firms with an invitation-only, Web-based survey during December 2016 and January 2017. 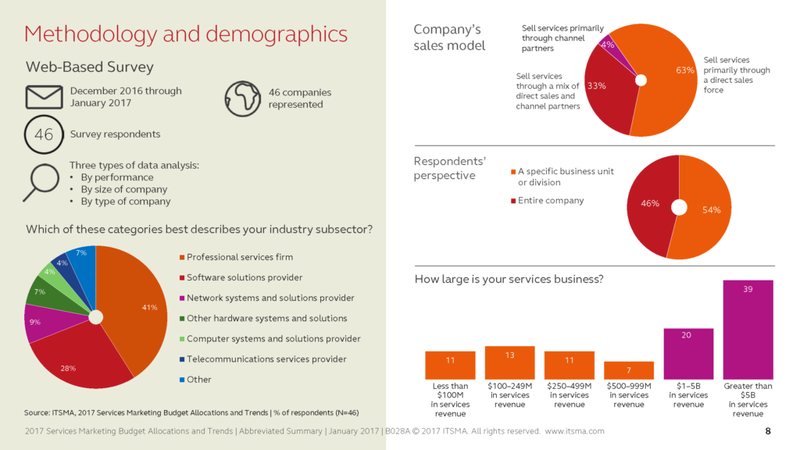 Survey respondents were 46 senior marketing and services marketing leaders at 46 global firms, roughly half product-based and half professional service firms, with 59% of the respondents from $1 billion+ companies. Netmagic IT Services Pvt, Ltd.